We all remember the stigma of yellow teeth and tobacco cigarettes. Now that vaping has become the latest trend and on the rise, many don't attribute the same oral risks to vaping as they would to tobacco cigarettes. Studies are showing that vaping can be equally dangerous to your oral health---just as bad if not worse than smoking traditional tobacco cigarettes. People assume vaping is safe option, but that's just not the case. The chemicals used in vaping can be very damaging to teeth. Vaping might taste good with all the different flavors, but it's certainly not good for you. Vaping can cause cavities, damage to oral tissue, enamel issues, and even lesions. Dry mouth is another symptom from vaping...and constant dry mouth can lead to other oral issues. Vaping can also lead to tooth loss and more superficially lead to yellowing teeth. 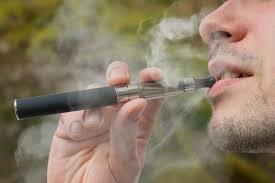 There are many articles that you can find on the oral side effects of vaping. Most importantly, talk to you children about the damaging side effects and become educated on the risk factors. Knowledge is power. Although vaping seems like the new trend without the same risks as tobacco cigarettes, adults and teens would be wise to research the chemicals in vaping and the long-term consequences of regular vaping. Check in with your dentist and ask her/him about the vaping risks and effects. Vaping might seem benign, but the more we learn about this new trend, the more we learn that the best option with vaping, is not to vape at all.